The aim of this document is to enhance the professionalization and capacity development of ECCE teachers in the region. 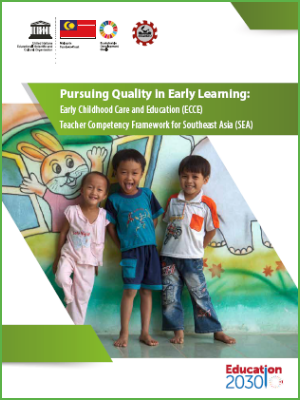 To develop baselines of ECCE teachers and practitioners in the countries of Southeast Asia and the Pacific SIDS, in terms of qualifications, standards and required/desired competencies; pre-service education and professional development; status, working conditions and environments. To develop a regional ECCE teacher competencies framework(s) for Southeast Asia and the Pacific SIDS. To support selected countries to upgrade their national ECCE teacher policies, qualification frameworks, standards and/or curricula.